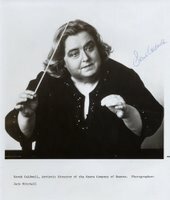 It was announced today that Sarah Caldwell, director and conductor of the Opera Company of Boston, died yesterday in Maine at the ae of 82, the NY Times reported today. For those from Boston who love opera, Caldwell was an icon. Her acievements were legion, being the first woman to conduct the Met orchestra and only the second to conduct the New York Philharmonic. She was even named "Music's Wonder Woman" by Time magazine in 1975.